Established by decree of the Regional Land and Environment 257 of 11 May 1995, it has been entrusted to manage the Italian Association for the WWF. The reserve covers almost a thousand hectares, divided into Zone A Reserve (707 ha), and Zone B of Pre-Reserve (278.75 ha). The staff employed by the Managing consists of 4 surveillance operators and a director.Much of the reserve includes private property, in which small and large companies engaged in the age-old activities of the “cultivation” of salt. 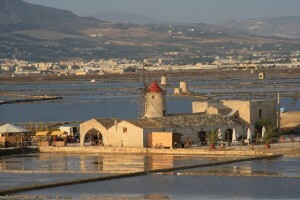 The site is one of the most important coastal wetlands in western Sicily; largely occupied by saline cultivated in the traditional way, with marshes and farmlands in marginal areas, its biological meanings are multiple, affecting the fauna (birds, fish, arthropods), flora, vegetation. These values are added those landscapes, ethno-anthropological, architectural, historical. Coastal lagoons (cod. Natura 2000: in 1150, a priority habitat) The water used for the extraction of salt, given the techniques used (which are traditional in use for centuries) and the particular geomorphology of the coast (which saw the presence of lagoons and coastal marshes), constitute an environment that though largely artificial, home to great biological diversity, from microscopic bacteria to the macroscopic birds. These organisms are extremely specialized for this environment, and for the various degrees of salinity present in the various tanks, or (as in the case of birds) that are located in this park environment and food during migrations. 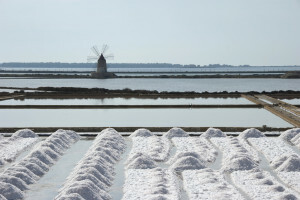 Mediterranean salt steppes (Limonietalia) (cod. Natura 2000: 1510, priority habitat) Associations rich in plant species of Limonium (many of which are endemic) with presence of Lygeum spartum, soils temporarily or periodically permeated with salt water and subjected to extreme aridity summer. Fruticeti halophiles Mediterranean and thermo-Atlantic (Sarcocornetea fruticosi) (cod. Natura 2000: 1420) Among the characteristic species of the Reserve, the endemic Calendula maritima is one of the most valuable. 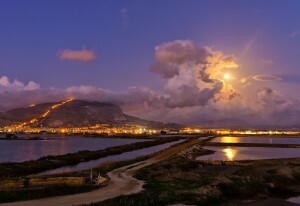 Its range is in fact limited to the coastal area between the Lagoon of Marsala and Pizzolungo area, just north of Trapani. The Island Ronciglio (now connected to the mainland by salt, and falling within the boundaries of the Reserve) is one of its “loci classics”: the description of this species that is was done on the basis of plants from this località.Le preferences Ecological led her to occupy a narrow coastal strip, close accumulations of Posidonia beached. A real “attraction” of the Reserve is the “Mushroom of Malta”, which actually is not a fungus but a parasitic plant (Cynomorium coccineum L.). It is a rare species: in Italy, in addition to the area between Trapani and Marsala, you can observe it only in a few coastal areas of Sardinia and Basilicata. The environment of the salt marshes, brackish strongly, is the kingdom of Chenopodiaceae: along the banks of the salt and brackish marshes temporary this family of flowering plants shows off its wealth of salt-tolerant species belonging to several genera (Salicornia, Arthrocnemum, Halopeplis, Halocnemum, Suaeda, Salsola, Atriplex, Halimione, Beta).It is herbaceous species or small shrubs, able to grow in this environment (particularly “extreme” for the presence of salty soils) due to different mechanisms of adaptation: many of these plants have thick leaves, where water is stored , and from which they are “expelled” excess salts. Many rooms are also in the Reserve, each of which correspond to different plant communities and different plant species: the freshwater streams, marshes and freshwater wetlands, beaches, lawns ephemeral, grassland brackish.Even in the tanks and canals of the salt marshes are interesting plant communities, with the presence of seagrass which Ruppia drepanensis and Posidonia. The remarkable presence within the boundaries of the reserve of several rare plant species, including among those most vulnerable to the risk of extinction in the “Red Book of Plants of Italy”.